Viewers of BBC television news on October 11th saw yet another report from Orla Guerin on the topic of the current wave of terrorism in Israel. A similar but shorter version of that report also appeared on the BBC News website on the same day under the title “Palestinians killed in Israeli air strikes on Gaza“, with its synopsis promoting equivalence between Israeli victims of terrorism and Palestinians mostly killed whilst carrying out terror attacks or engaging in violent rioting. That same equivalence was seen in news presenter Mishal Husain’s introduction to Guerin’s report. Mishal Husain: “A Palestinian woman and her two year-old daughter have been killed in an Israeli airstrike in the Gaza Strip following Palestinian rocket attacks. Escalating violence over the last fortnight has claimed the lives of four Israelis and at least twenty Palestinians. Our Middle East correspondent Orla Guerin sent this report. Guerin provides no source or evidence of independent verification for her claim that “an Israeli airstrike flattened the house”. The BBC’s Rushdi Abualouf who – unlike Guerin – is located in the Gaza Strip, had already Tweeted a different version of events and according to other media outlets, the house collapsed due to what appears to be a secondary explosion. “Gaza officials said a woman, 30, and her two-year-old daughter were killed when an explosion from a targeted Hamas site caused the collapse of a nearby home. Three others, including a 15-year-old youth, were wounded, according to Reuters. Predictably, Orla Guerin shows no interest in helping viewers understand why a Hamas weapons manufacturing facility was located in a residential area. Given that three years ago the BBC inaccurately reported an explosion in a house in the same neighbourhood in which a woman and small child were killed as having been caused by an Israeli airstrike, one might have expected more caution and fact checking to be in evidence before Orla Guerin promoted her version of this event. Guerin then goes on to give the following description of an incident which took place near Ma’ale Adumim on the morning of October 11th. According to official statements reported by the Times of Israel, the gas canister did not in fact explode as Guerin claims. “The Shin Bet said in a statement that around 7 a.m. a traffic police officer noticed that the woman was driving in the public transportation lane while tailgating a police vehicle. Police said officers noticed a suspicious vehicle driven by a woman heading toward a checkpoint on the way to Jerusalem and signaled to her to stop. The woman then yelled “Allahu Akbar” (God is most great) and set off the explosive detonator in her car, a police statement said. A gas canister in her car did not explode, however. 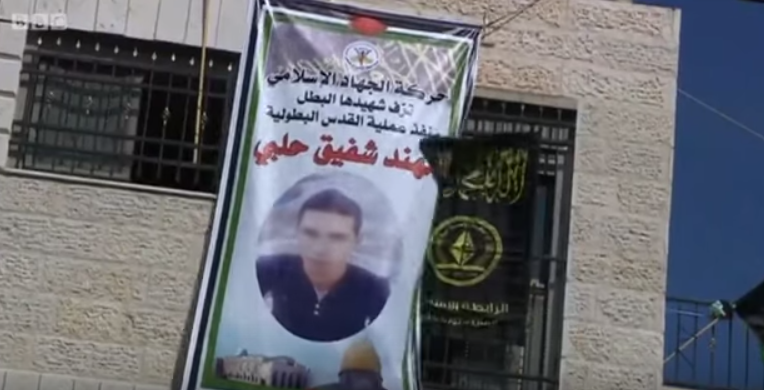 Notably, the footage shown immediately after Guerin has told audiences that “there’s no sign of involvement by militant groups” shows Palestinian Islamic Jihad banners at the home of the terrorist who carried out the October 3rd attack at Lions Gate in Jerusalem. That attack was later claimed by the PIJ and praised by Hamas. The flags of the terrorist organisations Hamas and the PFLP are seen in the footage shown as Guerin speaks, although she does not clarify that fact to viewers. Guerin’s narrative of “DIY unrest” and “low-tech” terror attacks fuelled by “anger and frustration”, together with her categorical statement denying “involvement by militant groups” obviously does not meet the BBC’s obligation to “enhance […] audiences’ awareness and understanding of international issues”. In all of the BBC’s reporting on the current wave of terrorism in Israel, the issue of the quotidian incitement on social media, in mosques, from Hamas, from Fatah and from the Palestinian Authority has been completely ignored. There is, of course, nothing surprising about that: since long before the latest surge in violence began, the BBC has habitually avoided the issues of Palestinian incitement, glorification of terrorism and indoctrination of Palestinian children. Although those issues are a crucial part of the story the BBC claims to be telling with reports such as this one from Orla Guerin, they do not fit into the narrative adopted and promoted by the BBC. Hence, even when a Palestinian Islamic Jihad banner is flying above her head, Orla Guerin ignores it. The trouble is that she would have BBC audiences ignore it too. Has there been one day in the last fortnight when there hasn’t been a stabbing or attempted murder by Palestinians? 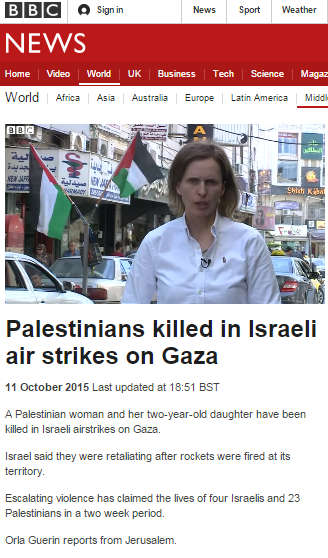 The BBC minimising Arab terrorism against Israelis – it’s what they do! Heaven forfend, but if she was mistaken for a Jew and got stabbed, I doubt she would refer to it as “unrest”.